InsyAllah, I'll do another giveaway soon-ish alrights? Anyways, here's a quick outfit of the day! 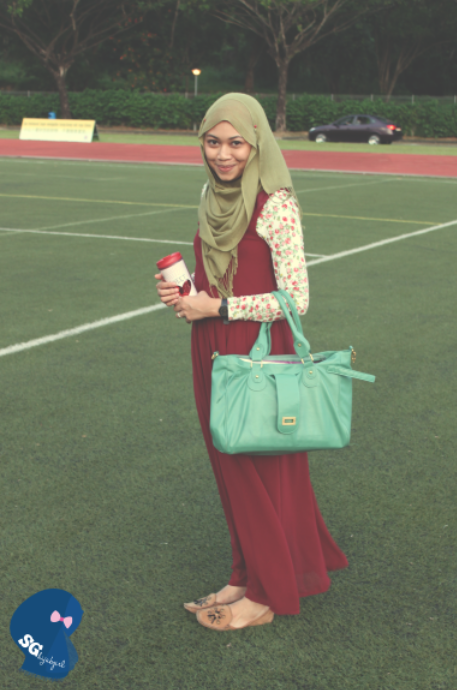 I love love love loveeee this chiffon dress from Poplook! I think the price is really inexpensive for something of such quality (you know those type of chiffon dresses/skirts that has very sheer lining? nope, this is not sheer at all!) I'm thinking of getting it in another color so maybeeeee, I'll be opening up a spree for Poplook soon (: Drop me an email sghijabgirl@hotmail.com if you're thinking of getting something from them k! This is probably my usual outfit for school. Simple! Usually I don't even bother with accessorizing...heh!